The Legend of Zelda: Breath of the Wild's second piece of downloadable content, The Champions' Ballad, is a distillation of everything the game does well. Its collection of puzzle shrines holds some of the most inspired moments of the series, culminating in a wonderfully complex final dungeon. It is a strong end to the DLC season that elevates one of the year's best games to further heights. 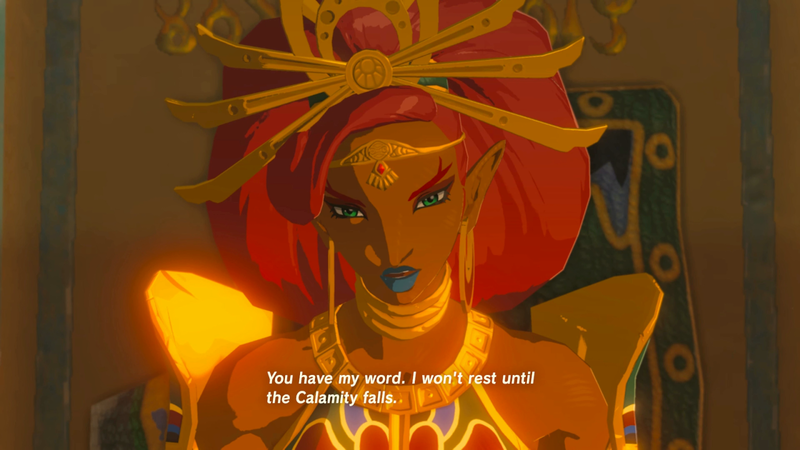 The Champions' Ballad sends Link on an endgame adventure to unlock the history of his fallen allies, who died over one hundred years ago fighting the demonic Calamity Ganon. After players complete all four of the main game's dungeons, they can embark on a fresh journey that emphasises creative problem solving through a series of escalating challenges ranging from a dangerous "one hit and you die" combat challenge to treasure hunt-like exploration to sixteen new shrines. While The Champions' Ballad occasionally struggles to link these activities together in a coherent sequence, the individual moments rank among Breath of the Wild's best. Link's journey begins with a punishing challenges. Returning to Breath of the Wild's opening area, the Great Plateau, Link is equipped with an ancient artifact that can destroy monsters in a single blow but leaves him similarly vulnerable. At first, this can feel excessive; Breath of the Wild puts an emphasis on player freedom, and imposing strict limitations comes off as a cheap trick to escalate the difficulty. As the sequence progresses, it becomes clear that Link's new fragility transforms the Great Plateau into a challenge that was previously limited to the game's dungeons. Defeating enemies requires an understanding of numerous weapon types and environmental quirks. It leaves a strong first impression that the DLC seizes upon to create a larger collection of deep challenges. "Breathe in the breath of the wild." Awesome puzzles, a great final dungeon, vivid side characters get a chance to shine. The middle section is unnecessarily padded, wish there was even more story content. Completed in about six hours. Loved nearly every second. This is most evident in the new puzzle shrines. The Champions' Ballad dots the world with a small handful of shrines that require unique application of Link's various rune-based abilities. Players use ice powers to guide a magic keystone through a giant pachinko machine, hitch rides on suspended blocks while dodging gouts of hot flame, nimbly dodge through laser beams, and rush through a spike-filled obstacle course. Every one of these shrines is a delight to explore and even more exciting to solve. Where the main game's 120 shrines sometimes suffered from repeated challenge types and lacklustre filler, The Champions' Ballad's are consistently well designed with unique solutions that involve coordinated use of Link's powers, often in surprising combination with each other. Where The Champions' Ballad falters is connecting these shrines into a proper journey. Link's quest takes players to four corners of the world, where he has to survey a small altar for clues to each shrine's locations. These clues take the form of a image of the game's map and a small riddle. Finding these locations leads to smaller challenges, such as fighting monsters or completing timed races. The extra exploration and contextless side content pads out the middle of Link's quest with arbitrary busywork. 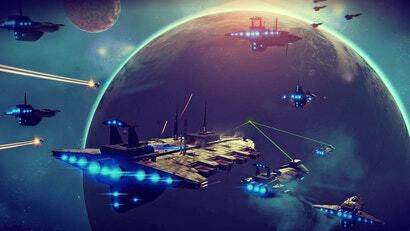 It's a damning low point that feels more like an underhanded means of adding playtime. Breath of the Wild offered a minimalistic story, opting to imply more about Hyrule's past than it ever showed. 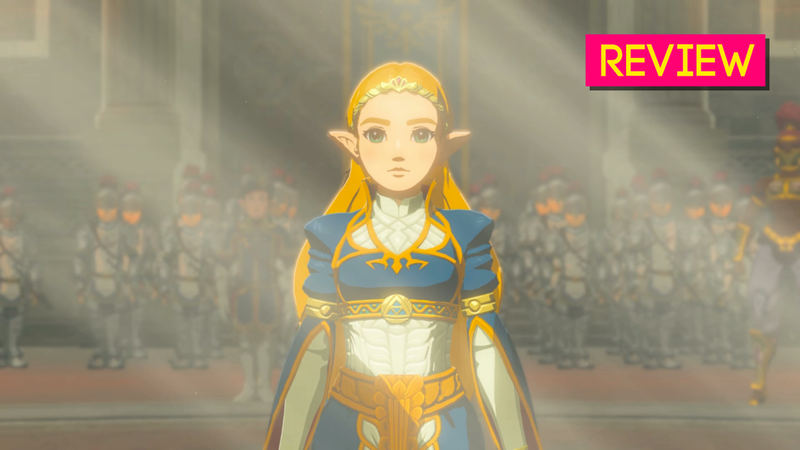 While some flashback sequences offered insight into Princess Zelda's personal story, the game left other characters on the sidelines. 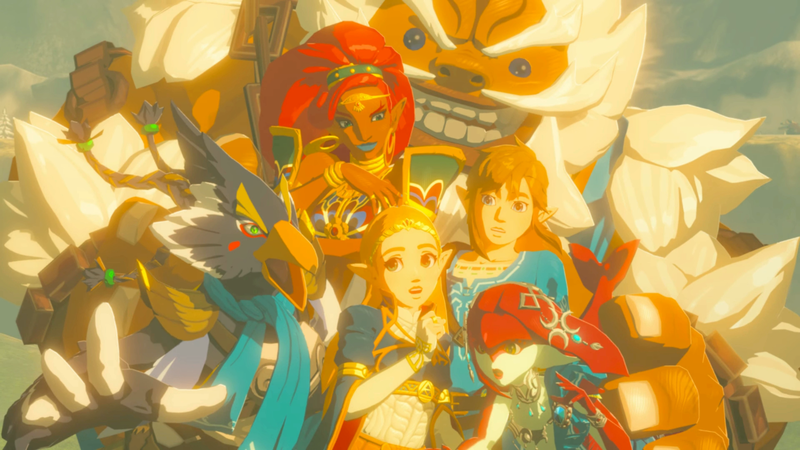 The Champions' Ballad offers more insight into the lives of the four Champions who fought beside Link and Zelda and the lead-up to Calamity Ganon's resurrection. Completing each area of the world unlocks a small cutscene featuring each of these heroes. Breath of the Wild's vibrant cast is on full display in these moments, and the world feels larger and more magical as a result. 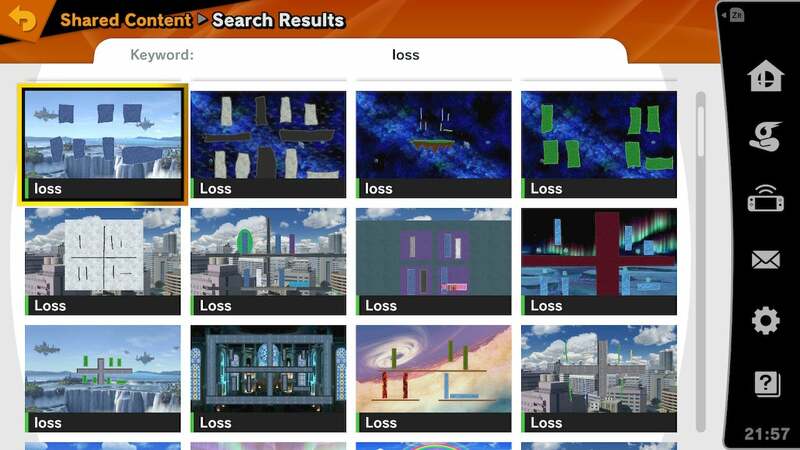 Unfortunately, there's only a few of these flashbacks throughout the DLC. Every one of them brims with character and charm, but players may ultimately find themselves starving for more story than the game provides. 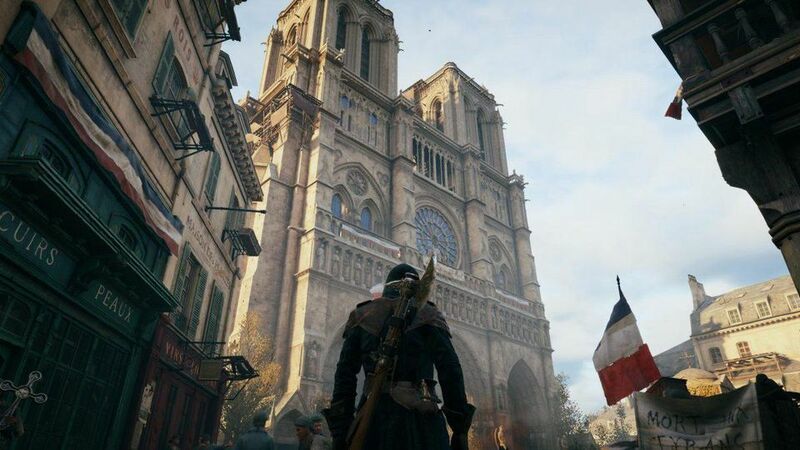 The main game's tone was melancholic. Link sifted through the ruins of the old world, dredging up memories of failure and loss. Hyrule was expansive but mostly quiet; exploration was a solitary affair that was equal parts adventurous and isolating. The Champions' Ballad is far more triumphant. As Link faces each new challenge, success breeds a sense of confidence. This is particularly true thanks to a series of remixed fights that pit him against difficult versions of the game's four boss monsters with a limited selection of weapons and items. There's a genuine sense of catharsis in defeating these monsters and purifying the world of lingering evil. It's a confirmation of Link's skill that also eases the souls of his lost comrades, a sort of ritual cleansing turned victory lap celebrating heroism over darkness. The Champions' Ballad ends with a proper dungeon that should satisfy even the strictest of series veterans. The main game's dungeons were a blur of shifting geometry and tricky navigation, but they never quite reached their full potential. Since players could access them in any order, they needed to accommodate fresh-faced explorers as well as hardened heroes. The Champions' Ballad is only accessible after completing these dungeons, and it plans accordingly with a challenge meant for experienced players. The final boss is a particularly exciting standout, with multiple phases and tricks that will leave players scurrying to adapt and fight back. Breath of the Wild's DLC started on an underwhelming note. Trial of the Sword was a glorified combat encounter that, while difficult, ignored many of the things that made the base game so intoxicating to play. The Champions' Ballad expands outwards to weave exploration, puzzle-solving and boss fights into a tantalising web of adventure. It slumps in the middle but rebounds with a soaring finale. Breath of the Wild's latest adventure is well worth the time and effort, ending on on a triumphant high. Wow, you just spoiled the ending of the DLC to people with that screenshot. Respect the developers who created the DLC and the gamers who haven't finished the EX 2. How disrespectful can you make an article that has spoilers. Yeah I totally didn't need that screenshot, author. Short though it was, I thoroughly enjoyed the Champions' Ballad. The main dungeon was interesting and challenging, and the final boss battle was (for me at least) totally surprising; and thoroughly enjoyable. 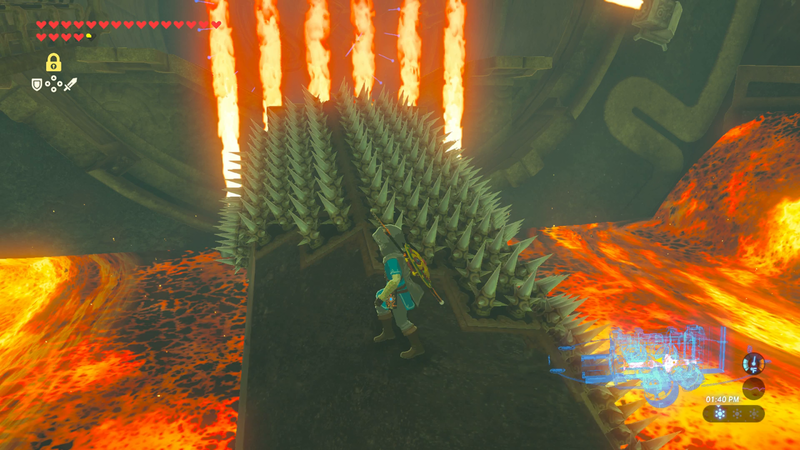 - The Daruk-based shrines will pose no challenge for anyone with fireproof armour. - I have all of these abilities and all of this equipment...but nothing left to do! - Still no post-Ganon game. - Why introduce a new and interesting weapon/game mechanic, and never let us use it again? On the fence somewhat - one of my gripes with the game was/is the lack of narrative so i'm excites to read that the dlc adds to that, however the comments that it's pretty much brief snippets that leave you wanting more are offputting as that's how i felt when i first finished the game. Great job picking the final prize for the dlc as your screenshot for this. Couldn’t have used the advertising shot of link on the cycle, oh no!! Honestly, an ounce of common sense should have been used on this.